I was excited to read About a Girl, by Sarah McCarry. The plot of a girl running away to find out more about her past from a famous musician really intrigued me. I had some mixed feels about the book, but overall I’m glad I read it. Before I continue with my thoughts, here’s a brief summary from goodreads: Eighteen-year-old Tally is absolutely sure of everything: her genius, the love of her adoptive family, the loyalty of her best friend, Shane, and her future career as a Nobel prize-winning astronomer. There’s no room in her tidy world for heartbreak or uncertainty—or the charismatic, troubled mother who abandoned her soon after she was born. But when a sudden discovery upends her fiercely ordered world, Tally sets out on an unexpected quest to seek out the reclusive musician who may hold the key to her past—and instead finds Maddy, an enigmatic and beautiful girl who will unlock the door to her future. The deeper she falls in love with Maddy, the more Tally begins to realize that the universe is bigger—and more complicated—than she ever imagined. Can Tally face the truth about her family—and find her way home in time to save herself from its consequences? Overall, I liked the plot a lot, but didn’t really connect with the writing or the character. The book felt a little too slowly paced for me. There are lots of long, beautifully-written paragraphs of description, which I can see a different reader enjoying, but that for me just made me feel distracted from the story. One reason I might have ad a little trouble with this book is that it is actually the third book in a companion series. I have a feeling if I’d read the previous two books I might have felt a little more keyed into what was going on. Aside from the plot, I also really liked the descriptions of Tally’s unusual family and the positive portrayals of a bisexual character and a trans character. If the plot summary sounds interesting to you I might give this book a try. But if you like your stories a bit more fast paced than this might be one to skip. This entry was posted in Book Reviews and tagged book review, books, YA by Alison Doherty. Bookmark the permalink. 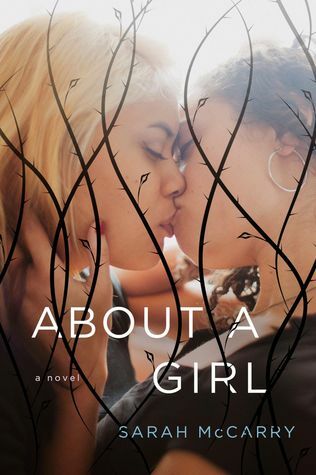 This sounds cool, but I feel a little trepidatious about a lesbian romance in which the protagonist has mother-abandonment issues (if it’s meant to have any bearing on her sexuality, because that’s a too-common explanation and I don’t buy it at all). However, I am still definitely going to check the book out further! Yeah, I didn’t pick up that the mother issues were connected to her sexuality … but maybe it was something I just didn’t know to look out for. I would love to know your thoughts on the book if you do read it.